7 Biggest Benefits and Drawbacks of Dividend Investing | Wealthy Education - Investing Strategies That Work! 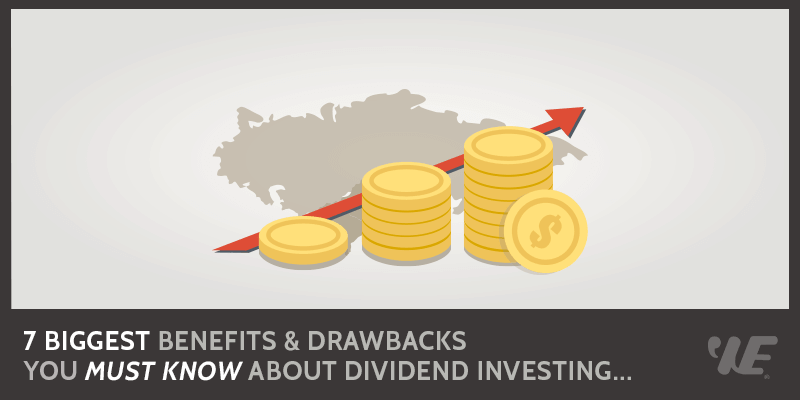 Dividend-paying companies distribute a portion of their net income to holders of their stock each year, and reinvest any remaining profits back into their business. Because these dividend stocks make regular cash payments to their shareholders, they can be a great way to introduce the element of passive income into your investment portfolio. Dividend stocks also offer a number of benefits that go beyond the allure of passive income, but as with every investment, both the advantages and disadvantages of dividend investing should be examined before buying in. Most investors like dividend stocks because of the fact that they can provide a steady source of income with little or no work, much like interest from a bank account but with a greater potential for return on investment. Although expecting dividend-paying companies to continue to make good on their dividend payouts may sound a little risky, the fact is that mature, well-established companies will go to great lengths to not only keep their dividends consistent and predictable, but to increase the amounts paid out on a regular basis. Stable dividends are one of the most important factors in a company’s ability to keep its stock price strong, and dividend-paying companies make it a priority to do whatever is necessary to maintain a healthy financial position. Compounding is a powerful way to increase your income by using earnings to generate even more earnings. Through compounding, you can earn more income without having to invest any additional money of your own, simply by letting your earnings go to work for you. In the case of dividend investing, when you use your dividend earnings to purchase additional shares of company stock, you’ll earn more money because every share you purchase earns its own regular dividend payout. This compounding strategy benefits from the power of exponential growth: your original investment generates a certain return that can be reinvested to produce greater returns, and those returns can be reinvested, and so on. The longer you continue to reinvest, the more quickly your returns will grow. When you invest in dividend stocks, you stand to profit in more ways than one. We already understand the potential for regular payouts offered by dividend investing, but there is also a return on investment when your share prices increase. Non-dividend-paying stocks only offer a potential for profit when you buy their shares at a low price, and sell them for a higher one. Dividend stocks, on the other hand, allow you to share in company profits while also retaining ownership of your investment. And since a large number of dividend-paying companies are financially stable and relatively reliable, their stock prices tend to increase over time, as their perceived investor value continues to grow. We know that reinvesting dividend earnings is an effective way to take advantage of the power of compounding, but it can become even easier and more convenient when you use a DRIP, or dividend reinvestment plan. As a program that allows investors to automatically reinvest their cash dividends back into additional company shares, DRIPs combine the advantages of both compounding and dollar-cost averaging. These automatic share purchases generally occur on a company’s dividend payment dates, and may be managed by the stock company itself, or by an outside agent or brokerage. One of the best features of many DRIPs is that they allow you to buy additional company shares commission-free, or at a discount. One of the main drawbacks of dividend investing is that your dividend payments are effectively subject to being taxed twice. The first instance of taxation occurs before you receive your dividends, because the corporation issuing them from its net income has to pay tax on its annual earnings, and it’s those earnings that generate the company’s dividend payments. The second taxation occurs when you, as the investor, must pay personal income tax on any dividends you earn over the course of a given tax year. In essence, this double taxation means you are paying tax both as a partial company owner, and as an individual. A company’s plan for determining its dividend amounts, and any potential increases based on future earnings, is known as its dividend policy. When a dividend-paying company makes changes to its policy, particularly those that lead to cutting or eliminating payouts, it will have a negative effect on the company’s stock price. A stock market theory known as the clientele effect surmises that a stock’s price is strongly linked to investor reactions to company policy changes, so that when those changes occur, many investors will buy or sell their company shares accordingly. If a company is forced to cut its dividends for any reason, you run the risk of not only losing your regular share income but also your accumulated share appreciation, as other investors sell and move on to other stocks. Investing in companies with a high dividend payout ratio involves a certain amount of risk. The dividend payout ratio of a company’s stock reflects how much of its earnings are being paid out to shareholders versus how much is being kept to pay down debt, reinvest in growth, or to serve as a cash reserve. Determining the amount to pay out to shareholders can be a delicate balancing act for many companies, since they want to attract and keep investors with high payouts, but retain enough of their earnings to support future expansion, and their ability to raise dividend amounts, at the same time. The fact is, when a company’s dividend payout ratio becomes too high to be sustainable, it can often lead to the business having to cut or eliminate its dividends altogether. Dividend stocks tend to be less risky than non-dividend stocks overall, but in order to make the most of everything they have to offer, you should become familiar with both the pros and cons of dividend investing before attempting to put them to work as part of your investment portfolio strategy.